An international team of astronomers has identified a star that passed through the outer reaches of the Oort Cloud some 70,000 years ago. It came within a distance of 0.8 light-years, making it the closest known flyby of a star to the Solar System. The star, dubbed Scholz's star, is actually part of a binary system. Its companion is a brown dwarf, a kind of "failed star" reminiscent of a gas giant. After analyzing its current trajectory, a group of astronomers from the United States, Chile, Europe, and South Africa have calculated that at its closest approach, it came within approximately 52,000 AU to the Sun, or 0.8 light-years. That's 5 trillion miles (8 trillion km), which, by cosmological standards, is excruciatingly close for an interstellar flyby of this nature. When it visited our Solar System, it flew through the outer reaches of the Oort Cloud — a massive spherical region comprised of trillions of bits of ice, rock, and planetesimals. The cloud's maximal distance is 0.8 light-years, which places it at one-fifth the distance to the nearest star, Proxima Centauri. The outer limit of the Oort cloud is considered the cosmographical boundary of the Solar System and the outermost limit of the Sun's dominant gravitational influence. When Scholz's star was in the neighborhood, it would have been a 10th magnitude star (red dwarfs are very dim). That's about 50 times fainter than what can be seen with the naked eye at night. Under normal circumstances, it would be invisible. But because red dwarfs are magnetically active, it could have briefly "flared-up" (i.e., V-band flares) to become thousands of times brighter. The astronomers say it's possible that the star was visible to our paleolithic ancestors for a few minutes of hours if this rare flaring event transpired at the time. Scholz's star is now 20 light-years away, but it displays very little motion across the sky, or what astronomers refer to as slow tangential motion. To the scientists, this indicated one of two possibilities: either the star is moving directly towards us or it's moving away. "Most stars this nearby show much larger tangential motion," noted University of Rochester astronomer Eric Mamajek in a release. "The small tangential motion and proximity initially indicated that the star was most likely either moving towards a future close encounter with the solar system, or it had 'recently' come close to the solar system and was moving away. Sure enough, the radial velocity measurements were consistent with it running away from the Sun's vicinity – and we realized it must have had a close flyby in the past." The trajectory of Scholz's star was pieced together by taking its tangential velocity and radial velocity, which the astronomers did by measuring its spectrum and doppler shift. By doing so, they were able to trace it back in time to its position 70,000 years ago. On a related note, astronomers recently calculated that "rogue star" HIP 85605 will come close to our solar system in about 240,000 to 470,000 years from now. It was initially thought that HIP 85605 will come within the Oort Cloud, but the new study suggests the original calculation was off by a factor of 10. They now believe it won't come any closer than about 200 light-years. Which is good news. Large celestial objects that pass through the Oort Cloud, dubbed Nemesis Stars, can change the trajectory of asteroids and other objects, resulting in "comet showers." As for Scholz's star, models indicate there was a 98% chance that it grazed the outer reaches of the Oort Cloud. 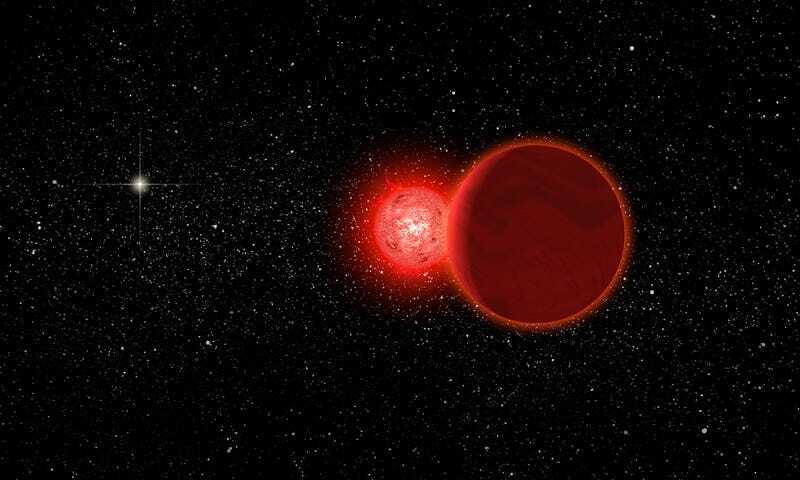 The scientists say it's unlikely, therefore, that this red dwarf — with a mass 8% that of the Sun — and its brown dwarf — at 6% the mass of the Sun — perturbed the Oort Cloud to a significant degree. Read the entire study at Astrophysical Journal Letters: "The Closest Known Flyby of a Star to the Solar System".